I think the first time I baked a chocolate chip cookie was when I was in elementary school. I probably baked the recipe behind the Hershey’s Chipits package. I thought it tasted amazing the first time I had it fresh. But I always wondered how they make cookies chewy, you know, the big mass-produced ones sometimes found in vending machines. I finally came to understand through reading cookbooks, that the recipe makes all the difference, such as the brown sugar proportion, butter, etc. Taking a break from some of the more complex recipes that I recently posted, I am sharing this simple cookie recipe with my own little twist. 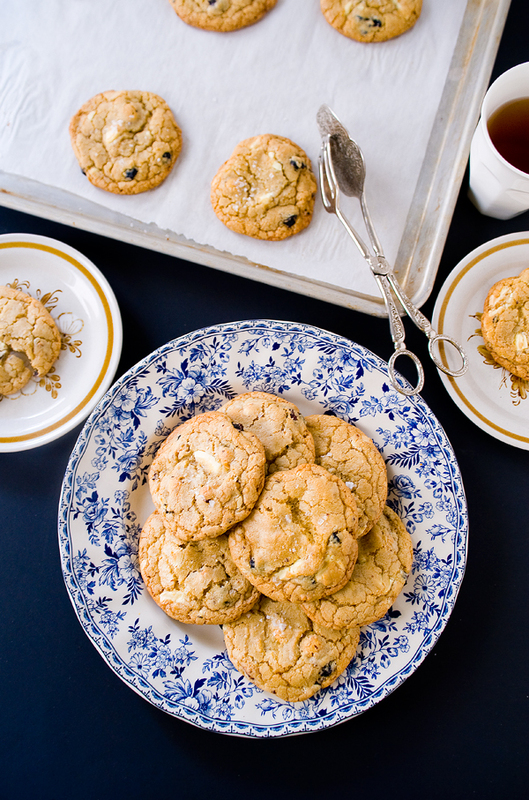 Instead of the good old chocolate chip, I added what I think are absolutely delicious – toasted hazelnuts, white chocolate, and dried blueberries. 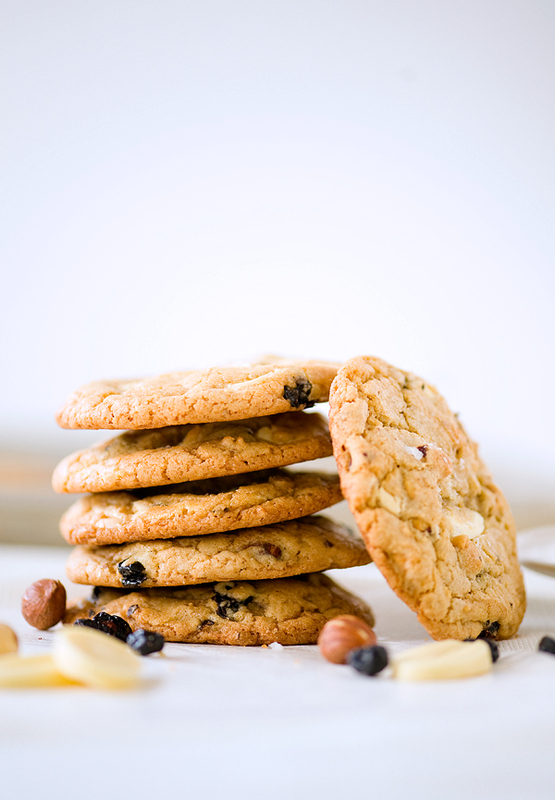 Chewy, salty, nutty, fruity and chocolaty, these salty white chocolate hazelnut blueberry cookies are the perfect companion with a good cup of black coffee. Yield: Makes about 34 cookies. Preheat oven to 360 F / 180 C. Line 2 cookie sheets with parchment. In a small bowl, cover blueberries with about a cup of hot water and let it sit for 10 minutes, drain and set aside. In a small saucepan, melt butter over low heat. The butter should just be melted warm to preserve the moisture. Alternatively you can also melt the butter in a microwave oven for 2-3 minutes until butter is melted, stirring every minute until butter turns into a liquid. In a medium bowl, stir together the flour, baking powder, baking soda, and salt. Place sugars in a mixer bowl, pour in melted butter. Mix with a paddle attachment on medium until the ingredients are well incorporated. Add in vanilla extract, and eggs one at a time, mix well after each addition. With the mixer on low speed, incorporate flour mixture until it is no longer dry, about 20 seconds, scrape bowl. Add in the rest of the ingredients - nuts, chocolate, and blueberries to incorporate, just until they have been well distributed into the dough, avoid over-mixing. Scoop cookies into about 2 tablespoons each or use a #24 cookie scoop. Place cookies about 3" apart on the parchment lined cookie sheet, sprinkle salt on top of each one. Bake cookies one tray at a time in preheat oven for 10-14 minutes, rotating the pan halfway through. Cookies should be slightly golden around the edges, gooey and soft in the middle. Don't over-bake for soft and chewy cookies! Cool cookies before removing them from the tray. White chocolate can be tricky sometimes, it is not easy to find good tasting baking varieties as they tend to taste overly sweet and waxy. I suggest using a high quality white chocolate bar and chopping it unto chunks. I love the blueberries in here as they burst with flavour each time you bite into one. We often use raisins in cookies but they actually don’t offer much flavour. Dried blueberries have a much more intense aroma and they taste so delicious with hazelnuts, white chocolate with a sprinkle of Maldon salt. The salt is optional but I think it makes the cookie even more interesting. Since white chocolate can be very sweet, a touch of salt does wonders to the taste buds, it will make you reach for seconds. I froze some scooped cookie dough so I can bake off some more next time when I want a batch of warm cookies. I usually let them temper at room temperature for a little bit and sprinkle a little salt before baking them. There’s nothing more satisfying than a fresh cookie that is crisp around the edges, soft and chewy on the inside. These are so addictive, they became my instant favourite! Salty AND chocolate all in one cookie? Yes please, absolutely!